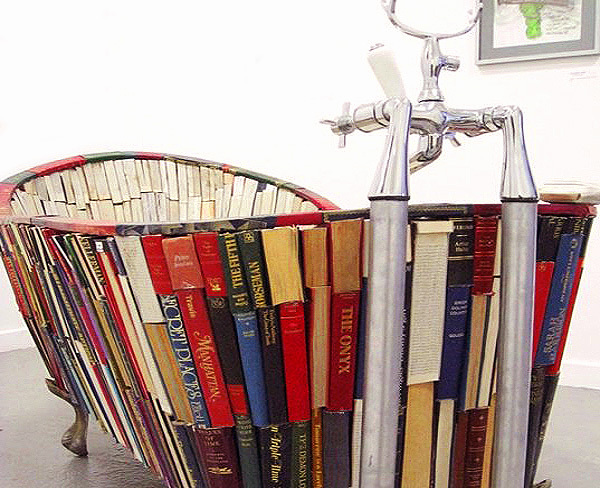 If you like to unwind by soaking in the tub with a good book, how about bathing in literature instead with artist Vanessa Mancini’s ‘Bath of Knowledge’? This novel idea (excuse the pun) is made almost entirely out of books, each one cut and fitted by the artist herself. The books have been layered onto a metal frame that rests on top of four antique feet shaped like lions. Encompassed in tightly crafted book slabs, this tub is as both charming and captivating as the literature it draws from. When it was created back in 2008, Mancini intended to protect the piece, turning it into a fully functioning tub. Instead, the tub remains unfinished as a mere piece to look at or rest in, water free. But regardless of its functionality, the idea of being able to slip into a warm bath of knowledge is certainly a refreshing one — even if its only in the imagination! If you like to unwind by taking a soak in the tub with a good book, how about bathing in literature instead by dipping into the Bath of Knowledge. This novel idea (excuse the pun) is made entirely out of books, each one cut and fitted by Vanessa Mancini. Books are layered onto a metal frame which rests on top of four antique feet shaped like lions. Surrounded in tightly crafted book slabs the bath looks dramatic and unusual, owed primarily to the volume of literature packed around the sculptural form.